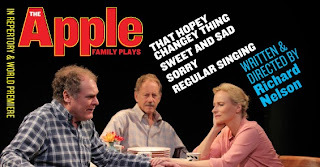 Tuesday night we saw a preview of Regular Singing, the last in Richard Nelson's series of four Apple family plays. Last year we saw Sorry, the preceding play in the series. We've yet to see the first two, but will. My wife was invited to the play by a friend who had a spare ticket because her husband couldn't attend, so I secured my own ticket. I waited until late, and consequently got what was probably considered one of the least desirable seats. These plays are in the Public's Anspacher Theater, where the "stage" is a flat floor with steeply tiered rows of seats on three sides. The first row of seats is at stage level; mine was one of these, furthest toward the back of the stage. This actually proved to be a fortunate location, as I was close to the table where most of the action took place. So close, in fact, that, not having dined before the show, I had to fight the temptation to ask one of the actors if I could have a plate of the mac and cheese sitting enticingly in a bowl a few steps from where I was sitting. It also helps to be close because these plays are performed in almost ordinary conversational, not full "stage", voices (the Public advises those who might have trouble hearing to get amplification devices they supply). This also aids the "suspension of disbelief." One really has the sense of being at an intimate family gathering. Some months after seeing Sorry, I found myself musing, "Who were those friends we visited up in Rhinebeck?" This illusion may have been facilitated by the fact--disclosure here--that two of the actors, Jay O. Sanders and Maryann Plunkett, Richard and Barbara Apple, brother and sister, in the plays, but husband and wife in real life, have been friends of ours since our children were classmates in elementary school. Each of the plays is set on a historical date--That Hopey Changey Thing on the date of the 2010 midterm elections, Sweet and Sad on the tenth anniversary of the September 11 attacks, Sorry on the date of the 2012 presidential election, and Regular Singing on the fiftieth anniversary of President Kennedy's assassination. Each of the earlier plays has had its opening on the actual day on which it is set; Regular Singing will have its opening tonight. Regular Singing, like Sorry, takes place in the home of Barbara Apple, a schoolteacher, in Rhinebeck, New York. Rhinebeck is a small town in the Hudson valley, an easy drive north from New York City. One of the play's characters notes that Rhinebeck's main street, followed south, eventually becomes Broadway. Some affluent City residents have summer and weekend houses in and near Rhinebeck, but the Apples are locals. Richard became a successful lawyer in the City, but in Regular Singing he's moved to Albany, where he holds an important position in state government. Moving seems characteristic for Richard. He's tightly wound, ready to spring, but at the same time elusive. In both Sorry and Regular Singing he keeps saying he needs to leave while Barbara implores him to stay. Barbara, single and childless in middle age, is the nurturing mother figure of the Apples. She shares her house with a younger sister, Marian (Laila Robins), also a teacher, who separated from her husband, Adam, after their daughter's suicide. There is a third, even younger, Apple sister, Jane (Sally Murphy), described as "a non-fiction writer", who lives nearby with her boyfriend, Tim Andrews (Stephen Kunken), an actor. Benjamin Apple (Jon Devries) is the siblings' uncle and a retired actor. He also shared Barbara's house after he suffered a heart attack that put him into a coma, from which he emerged with a mild dementia. The conflict in Sorry centers around the decision to have him moved to an assisted living facility, a decision that Barbara, ever the in-gatherer, opposes. As is appropriate for a play set on the anniversary of an assassination, and perhaps for the final play in a series, the theme of Regular Singing is death. The Kennedy assassination is discussed, but the central concern is the impending death of Adam who, despite their separation, has remained close to Marian and to Barbara, who has made her house his hospice. The play begins with the family gathered around the dining room table, and Jane and Tim breaking into song, a song to be sung at Adam's funeral. This leads to Tim's short discourse on the play's title, which was a liturgical controversy in colonial America. As the play progresses, Marian is frequently called to attend to the needs of Adam's mother, who is in a room offstage with her dying son. Richard seems a caged tiger; after Barbara gets him to sit down he accuses her and his other sisters of sabotaging his marriage. This leads to the play's emotional fulcrum, where his vulnerability becomes manifest. Amid the sturm und drang Uncle Benjamin, with his flat affect, sounds a note of stability. That may be why Barbara repeats almost everything he says. Near the close of Regular Singing Barbara reads to the others sentences each of her students has written about death, an assignment she gave them in connection with the Kennedy anniversary. Then there is a recitation of a secularized 23rd Psalm Adam wrote for his own funeral, ending with, "and I shall dwell in Barbara's house forever." I wrote in the note for SORRY that it is my hope that these plays are about the need to talk, the need to listen, the need for theatre, and the need to be in the same room together. Maybe it's really just saying the same thing another way, but I want to add that it is also my hope that they are about the need to know, in small or even some bigger ways, that we are not alone. I'm very glad to have been in that room.